Nana Evelyn would have been 103 tomorrow. She was the matriarch of the Pereira Clan; the glue that held us together. She was also the most influential person in my life when I was a child. Nana was born in Igatpuri (or “Egg-it-puri” as she anglicised it) in 1908 to John and Lucy Cordeiro, the youngest of five children – Angela, Jessie, Irene, Albert and Evelyn. She met Papa Wenzil through her brother Bertie as both men worked in the Telegraphs. Papa Wenzil and Nana Evelyn married on 9th February 1930 (see photo) and together, they had nine children. Papa died on 5th September 1971, but Nana lived on till she was 92 – a steadfast, loving presence in our lives. She would have seen wars, India’s independence and even the new millennium unfolding before her eyes, but her greatest treasure was her family. While her second child Anthony died just seven months after he was born, the remaining eight children all married and had 20 grand-children between them. Us grand-kids have gone on to have 29 great-grandchildren – and still counting! Nana loved it best when her family got together. So every Sunday evening, come hell, high water, or Hill Road traffic jams, the Pereira Clan would meet in Nana’s house. Uncle Merwyn and Uncle Trevor R. in their company cars with families in tow, and the rest all congregating at Anthony’s Cottage, 8 D’Monte Street, Bandra, Bombay. The ‘big cousins’ would heave the wooden bench from the back and the chairs from the hall to form a circle in the sitting room, with Nana in her usual spot in the middle. One by one we would go to Nana to have a chinwag; holding her hands and sharing our delights and disappointments with her, while all around the room exploded in peals of laughter as one anecdote after another was related. By 8.30pm, after eight dozen or so sev puris were polished off, it was time to wrap things up. But not before Aunty Marie tried to swap one more recipe at the doorstep and Uncle Chris L. threatened to go home – with or without her! Nana’s eyes were riddled with glaucoma and cataract problems when she was in her late ’70s, but she was still sharp as a tack. When Uncle Chris P. would return home from work with The Afternoon tabloid, Nana would be itching to do the 9-letter word puzzle – all in her mind’s eye. We would call out the letters: P, N, E, H, S, A, P, I, S; with ‘S’ as the must-use letter. “Happens, shapes, hessian, ashen... Was there one ‘S’ or two ‘Ss’?” she would query. Two. “I’ve got it: Happiness.” Ditto for solving the crossword puzzle. Ditto for doing mathematical calculations. How did she do it? The mind boggles. If Nana was full, she would say, “I’ve done well.” Translation: I’ve eaten enough. And in the same breath she would ask, “What’s for dessert?” But you just said you were full... “I’ve got a separate pouch for ice-cream,” Nana would claim. Butterscotch (with the praline bits) was her favourite. So is mine. Everyone who knew her called her “Nana” – not just the family, but even the Hindu and Muslim neighbours living in chawls on either side of Nana’s house; even ex-boy/girlfriends of the big cousins; even the maids... But the next generation i.e. the great-grandkids coined another name for her: “GiGi” – “Great Grandma”. Her sense of propriety was apparent in how she always wore a full petticoat even under her house-dresses. A special occasion like the Bandra Feast or a family wedding meant that Nana would wear a new dress stitched by my aunt Cassandra – not without a spritz of Charlie perfume. Nana was a devout Catholic whose faith was a part and parcel of her life. So if it was 8.30pm, we were all on our knees in front of the altar, saying the rosary. Nana always blessed our foreheads with the Sign of the Cross and made sure we kissed the crucifix before we said goodbye. Till today, we all do likewise. Nana Evelyn passed away on 22nd December 2000. I still miss her. * Pic 1: A collage of Nana and Papa on their wedding day; the two of them, with their children. 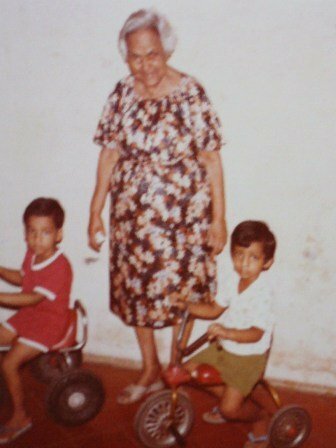 * Pic 2: Nana Evelyn with her youngest two grand-children, Jason (L) and Neil (R). Nana was very perceptive and knew all of us grandchildren very well, our natures, likes and dislikes. I loved spending the day with her during my school holidays. Later on when I visited her in the afternoons after Uni, I often had lunch with her and we had the most interesting conversations which I will always treasure. I loved having sleepovers at Nana's house with all the other cousins especially when our mums and dads used to go for the occassional dinner/dance and we had lots of happy memories of Sunday evenings at D'Monte Street Nana's house. One of the hardest things was going to wish Nana goodbye when we left for Perth. On our first visit back, she was the first person I went to see and I only had to say "Nana" from the front gate and she knew my voice and rushed to kiss me. I will always remember Nana Tootsie or D'Monte Street Nana as we referred to her as being a very loving and clever woman, who made the most of what little she had, who had wonderful outlook on life and who gave me some wonderful advice all through my life and for that I feel very blessed. Nana always called me her "boyfriend|" What a special bond we had - I guess (hope) Nana had that with each of us in her own special way. Nana was so "cool". For me she was ready to listen with an open mind - and then make the call - and call it like it was that she did whether you liked it or not. The lovely part about it was that I could chat with her about "almost" anything. Gosh I loved making her laugh and could even get away with mild vulgarity. She may have lost her sight but I tell you nana could see" clear as". For me, if ever I had to picture "pure faith"- without a doubt it would be my nana. We were truly blessed to have had her in our lives. Hey given the fact that we are not a big family but rather a small village with our numbers- and we are still so close to each other- through each of us and the bond we share- Gigi LIVES! Siblings Angela Valladres , Jessie Mendes, Irene Athaide, Albert Cordeior, youngest Evelyn. Immediately after receiving your blog on Nana I sat and continued with the thought process. But it was just one of those things that were never to be. I don't know what became of it, and Trevor tried desperately, but failed. So here are a few more thoughts. 'They are not gone who live in the hearts of those who loved them" which I think is a fitting tribute to Nan, I wish I'd written earlier, but it was just one thing after another and the number of church services didn't help. Alla, here's something you might wish to share with the family.Did you know that Nana's mother, Lucy Cordeiro, who originally was Lucy Pereira, lost her mother at childbirth. Her father, who firmly resisted all attempts to marry again, brought her up single handedly till she was l9. Then panic set in. He knew that at any time in the future she would marry and leave him to fend for himself. So, he did the next best thing. He married a young girl, 23 years old and kind of made up for lost time.He had five children in quick succession, four girls and one brilliant son, and died soon after. His poor widow was left with the onerous task of bringing them up alone. Do you remember Mary Joan Fernandes and Ceila Williams, who were teachers in the convent? Their mother was Nana's half sister. To continue, Lucy Pereira married John Cordeiro who became a Guard on the GIP Railway (GIP stands for Great Indian Peninsula Railway) and was transferred to Bhusawal. where he brought up four girls (Angela, Jessie, Irene and Evelyn, and one son, Bertram. )Angela married Joseph Valladares, also a Guard on the railway, Jessie married Philip Veigas, Irene marrried Luke Athiade, Nana married Wenzil Pereira, and Bertie married Nellie Pereira. John Cordeiro's father was a doctor with the troops in the Boer War and he (john) was born in Aden. There's a medal he got and I think its with either Sydney or Derrick Cordeiro, which other members of the family would love to lay hands on. John was an outdoor man, he loved to hunt, fish and make his own buck shot which he did by melting old tin boxes and putting the molten metal thru a strainer!! Grandpapa also loved to fish so Lucy took along her knitting, since she was not allowed to talk... it would frighten away the fish. Here's another piece of info... once when he was on a shikari with a friend, his a friend saw a hynea and ran away with Grandpapa's gun. Poor Papa was left to face the fury of the hungry hynea, but overpowered the animal by stuffing his throat with stones.Papa came home badly mauled but he never lost his love of shooting and it was part and parcel of his life till Bertie took over. Alla, I've left out the Pereira side of the family, but I will fill you in later with whatever I remember. Thank you for your work on the blog, keep it up. Have a wonder-filled Easter. Our love to Breslyn and the children. In the 50's, we were yet under the spell, left by the British , and you only called Aunty or Uncle to an actual aunt/uncle----So when I was courting Enid ( 4 years apprenticeship), I spoke to Evelyn & Wenzil as Mrs or Mr Pereira. But all that changed over night after 12/10/1958, for then they were Mum & Dad. Blood hound ,was also another description of her--- as she could smell alcohol being poured by papa in the kitchen whilst she was busy at the middle room doing a crossword puzzle. To her Hindu neighbors she was Maji, but she was sweetness personified by any name. Is this an Amen to a blog that had much hope ? I often think of your dear Nana. I remember doing an interview with her for an assignment many years ago. What a wonderful woman. May she rest in peace.